2019 seems to have started on an incredible note for Bitstarz casino. For the second year in a row this incredible casino has picked up one of the most sought-after trophies at the prestigious AskGamblers Awards. The award it won this year was the Players’ Choice award, and it gave the casino some serious bragging rights, making it the only two-time winner at the AskGamblers Awards. This award is another feather in the cap of this amazing casino and one more addition to the growing collection of awards and trophies that the casino has won in the years of its existence. 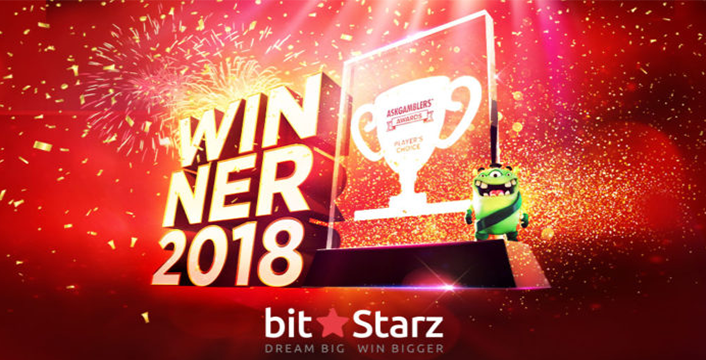 Why The Bitstarz Show at the AskGamblers’ Awards is Big News Winning at the AskGamblers Awards is a phenomenal achievement in itself; AskGamblers is after all one of the most respected casino review sites and industry watchdogs today. What makes it special is the fact that it is the players that decide the winner for this one. That is a huge boost to the credibility of the casino, because the players will pick as a winner only the casino that they have had a great experience at. And there is more; there were more than 1300 high quality online casinos in the fray when the bell rang. Once the smoke cleared and the debris settled, there was only one left standing – Bitstarz. And it was able to do so only because of the superlative experience it provided to that one component in the online casino ecosystem that mattered the most; the player. Bitstarz is not your regular run-of-the-mill casino by any yardstick. Its strategy of combining the personalized high quality service of a small operator with the software, game portfolio, bonuses and promotions that include incredible deposit bonuses and free spins, cool prizes and support system of a big fish has yielded rich results. Players love the way the casino looks and plays and have backed it to the hilt right from the time it launched operations. The list of software vendors reads like a who’s who of the industry; over 20 of them including some of the biggest of them all, like Microgaming, NetEnt, BetSoft Gaming, Pragmatic Play, Evolution Gaming, Play ‘N Go, iSoftBet, Amatic, Habanero, EGT, Endorphina, Yggdrasil, Booming Games and more. The casino also has a mobile version that is compatible with the Android and iOS smartphones and tablets. The mobile casino has a fairly big spread of games, though not as expansive as its desktop counterpart. Everything about Bitstarz screams class and player-friendly: there is the fact of a massive game portfolio – over 1800 games in all, including slots, table games, live casino games and jackpot games. And then there are the exclusive BTC games, games that you can play by betting in Bitcoins. All games at the casino come with high quality graphics and loads of exciting features. They are available for play directly in instant play mode; there is no need to download software. Every game at the casino is available for free practice play as well as real money play, except the live casino games. These are available only for real money play. The massive range of 1300+ games is the perfect launch pad to use the exciting promotions that Bitstarz offers its players. New players have great incentive t1o 111sign up thanks to a no deposit bonus of 20 free spins on opening an account. The welcome bonus itself is big – up to AU500 across the first 4 deposits and 180 free spins immediately after the first. The casino also has a good number of promotions for players who are already members with it. These include bonuses like Rook’s Double Cash, which is available if you play the slot Rook’s Revenge. There are also other cool promotions like Slot Wars, Table Wars, a 50% Reload bonus, free spins every Wednesday and more. One of the biggest features at Bitstarz is the ability to deposit and withdraw in multiple currencies. Apart from regular fiat currency like US Dollars, GBPs, Euros, Australian Dollars, Canadian Dollars, Swedish Krona. Norwegian Krone and more. You can also deposit and withdraw in Bitcoins and other cryptocurrency including Litecoin, Ethereum, Dogecoin and others. The casino is also very well-known for the super-fast speed of withdrawals. Withdrawals at this casino are quick procedures and the average withdrawal time here is a stunning maximum of 10 minutes. All these features are big draws among the younger generation. Among all the amazing things that draw players to Bitstarz casino is some excellent support. Players can contact a member of the support team through live chat or telephone. Each member of the support team has a minimum of 3 years’ experience in problem solving which means they know everything there is to know about the casino and the industry in general.